The thing I now like most about The Mash Collective is the thing I once struggled to understand. It’s the idea of getting non-brewers together to make a beer. The first one I ever received was the Aureus Chrysalis, which was made by a chef, tattoo artist, a furniture maker, an engineer/home brewer and a musician. The home brewer I understood. But a furniture maker? Really, what the hell was a furniture maker doing making beer? I just really couldn’t understand what the hell this was all about. If I’d have gotten the first release – Amasia – that would have screwed with my head even more because one of the brewers was a forensic scientist. Huh? I also couldn’t really work out if it was the Stone and Wood people behind it or if it was a totally separate thing. Yes, they are behind it. And, in case you’re wondering, yes I am an idiot for not immediately realising that. Anyway, as I said up top, I now really like this idea. I like it because it focuses on the idea that making beer can be a creative pursuit, that it shares things with the likes of musicians, writers, designers, tattoo artists, chef and, yes, even furniture makers and forensic scientists. 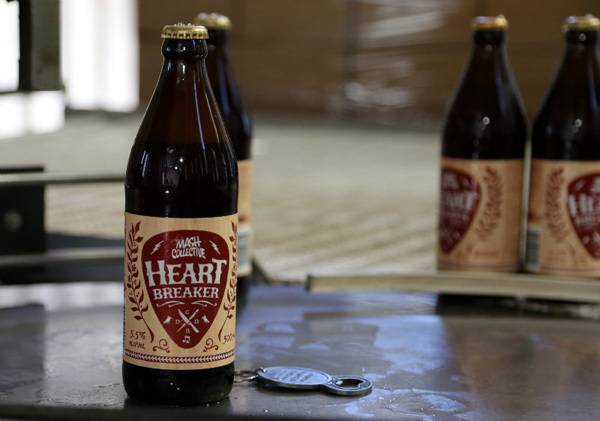 The latest Mash Collective beer is Heart Breaker, made by chef Clayton Donovan, Powderfinger’s Darren Middleton and designer Damian Kelly. They call it an amber ale (but I reckon it’s more red) and it’s been getting a lot of praise with people ranking it as the best Mash effort yet. That’s about right I reckon. Because it does go down very easily. It’s not one of those ‘‘look at me’’ beers, where one ingredient is the focus. Instead, it’s an effort where all the ingredients are blended together to create a very well-constructed whole. It’s been made with Australian quandong and pepperberry. Did I detect any of that? Nope, because I really don’t know what they taste like – or even what a quandong is (it’s a native Australian fruit – thanks Google). There are also loads of hops – Sorachi Ace, Ella, Centennial and Mosaic. I did get some lemon on the nose and some sweetness across the palate. But to be honest, I stopped thinking about all the flavours because I just wanted to sit back and enjoy the beer instead. I had this last night, really enjoyed it. Dry but are also fruity.